Schwartz muses on the Dutch research libraries he loves to visit, reminiscing about the past and worrying about the future. At the dawn of the Information Age I was unimpressed by the pace at which resources were being made available on Internet. It was thrilling, around 1990, to be able with some difficulty to access Melvyl, the digital catalogue of the University of California libraries, at my desk in Maarssen. I made a nuisance of myself by boasting about this. At a certain low point I broke up a dinner at home to take a befriended colleague up to my study for half an hour to show him which books of his – and mine – could be called up on screen. Melvyl was a help in finding book titles, but for the books themselves you had to go to the library. And I’m kind of pleased to say, you still do. Lots of early imprints and older reference works, thousands of journals and myriads of articles are available online, but not many scholarly books. Google Books is nothing but a tease. You get a feel of what you’re after, but when you approach the crux you’re frustrated by a notice that those pages are not available. The next step, working in the Netherlands, is to go to Picarta, an invaluable online union catalogue for the most important Dutch research libraries. There you can locate a particular title, with links to the record on that item in the online catalogues of the repositories concerned. With another few clicks the book can be ordered and made available to be picked up. If I’m not in a hurry, I can use the interlibrary loan service of the local public library around the corner and have it sent there. However, that library is manned by volunteers who do not all master the systems involved and get me into lengthy and sometimes testy interchanges. So I prefer to go to the research libraries themselves. That is where my geoscholarly advantage kicks in. Within an hour’s distance from my desk, I can be in the university and museum libraries of Utrecht, Leiden, Rotterdam and Amsterdam, and the National Library and Netherlands Institute for Art History in The Hague. Four of those locations are my favorites, places which to enter is balm for my soul, reëvocations of the feeling of inexhaustible riches and exploratory freedom I first experienced in the 1940s in the Arlington Avenue branch of the Brooklyn Public Library, which I am deeply touched to see still looks the way I remember it from seventy years ago. The general reading room has an immense treasure of reference works in open stacks. With some hesitation, I post these photos from 2015 and 2018. They show the graciousness of the facility, with daylight, soothing colors, some individual desks – and so much privacy that you often have entire decks to yourself. I’ve had to spend more time there than otherwise in the past few years, since the KB distrustingly instituted something called the Nederlandcollectie – all books published in the Netherlands or about the Netherlands – which are no longer available for borrowing outside the premises. The KB department of early imprints and manuscripts is in a small reading room – too small, so that all talk between staff and users is heard. I have to keep myself from daydreaming about my visits to the hushed old KB, in a town palace on the Lange Voorhout that was turned over to the High Court of Justice in 1982. 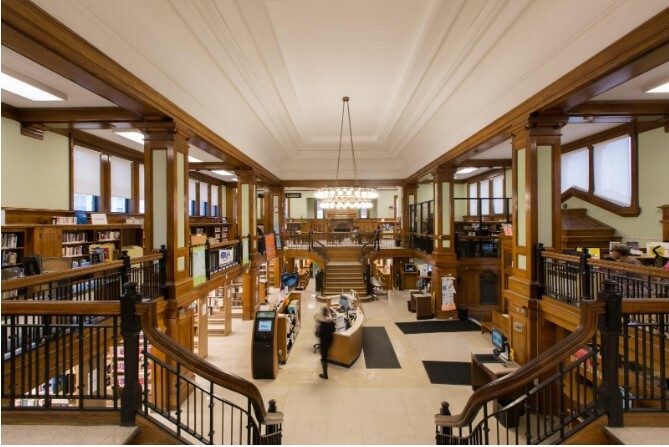 Still, I have always enjoyed working there, and have benefitted immensely from the advice and help of the librarians, especially the inestimable Ad Leerintveld. 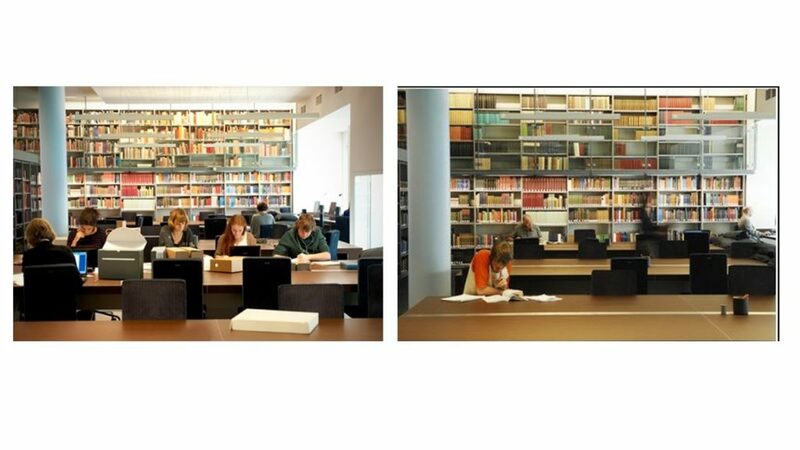 The De la Fontaine Verwey reading room in the Special Collections department (Bijzondere collecties) of the University of Amsterdam, installed there in 2007 behind a seventeenth-century façade, is larger and somehow more accommodating. In addition to the reading room, there are the Rosenthaliana library of Jewish subjects and the map room, places where you would also like to spend a lifetime. (The former housing of those collections, in the Longbowmen’s Shooting Range [Handboogdoelen] on the Singel, does not inspire nostalgia.) A disadvantage of the KB and Special Collections is that you have to order books in advance – a full day in advance is best, since deliveries from storage are made only twice a day. The bulk of University of Amsterdam library storage is in a depot behind the university hospital, in the middle of nowhere. I’ve worked there as well; the hospital atmosphere is contagious. The two art history libraries I use the most are in a class of their own. The Netherlands Institute for Art History (Rijksbureau voor Kunsthistorische Documentatie, RKD) is supremely well fitted for the study of Dutch and Flemish art. 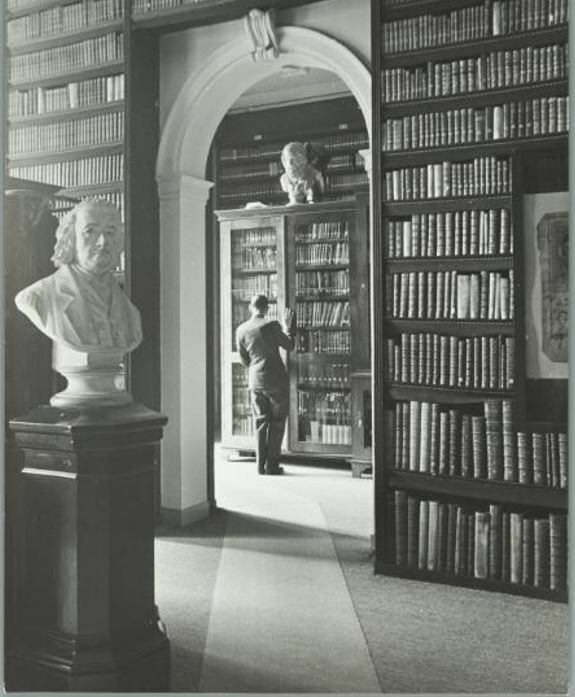 The library, based on holdings donated by Frits Lugt, is as close to exhaustive as it gets in its field, and books, sales catalogues and documents seldom take longer than fifteen minutes to be brought up for use. The green cardboard boxes contain so many photos and clippings that it might be the largest facility of its kind in the world. The RKD is quiet and spacious. Staffing is down these days, so it helps to know your way around. But more and more of the material is now online at RKD Explore. 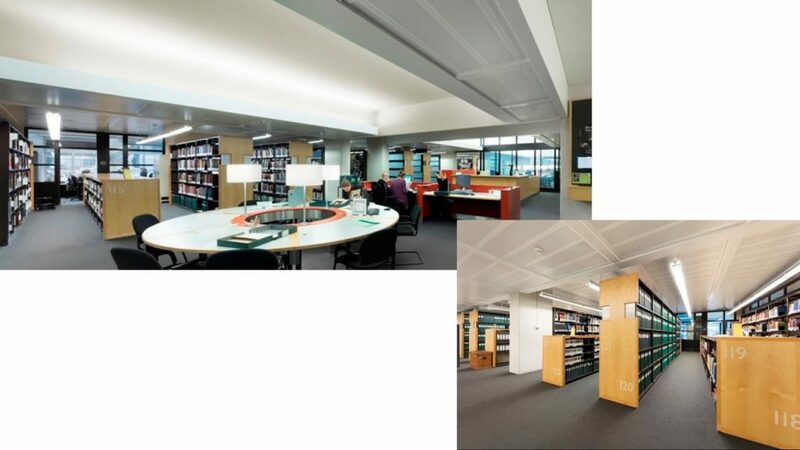 That the RKD is located on the ground floor of the National Library, a two-minute walk from The Hague Central Station, doubles and triples its usefulness. Here too I am the victim of glowing memories of the past. When I was a scholarly associate of the RKD, from September 1968 to June 1970, it was housed in the Sint Sebastiaansdoelen, the headquarters of the St. Sebastian Militia Company, across the Korte Vijverberg from the Hofvijver, the Court Pond. 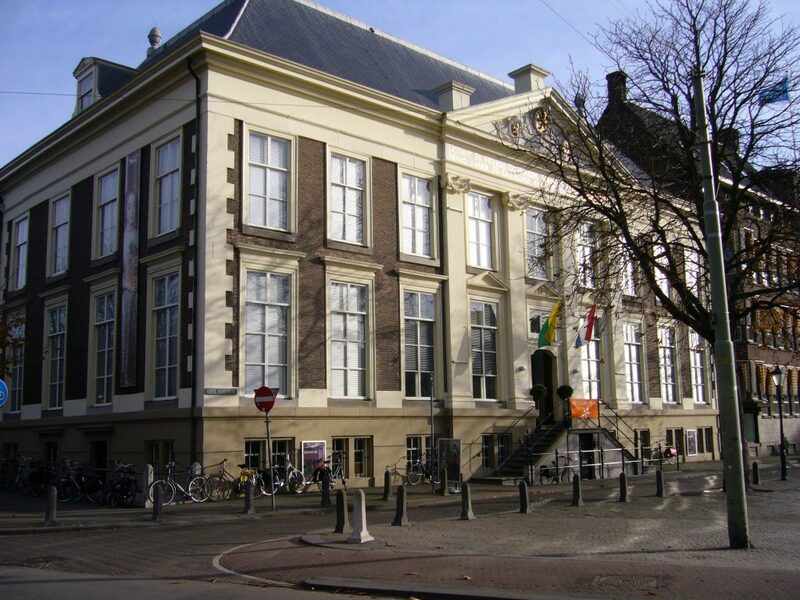 It is now the Hague Historical Museum. My desk was just behind the window to the right of the door on the main floor, the shiniest in this photo, in the room called Oude Kunst, old art. It did not have to be called Oude Nederlandse Kunst, everyone knew that. For private research outside of working hours I, like any associate so inclined, was given a key to the cellar door, which I opened on many a Saturday and Sunday. This was the view from my desk. The little building on the left is the Oval Office of the Netherlands, Het Torentje, where the prime minister sits. Further to the left, out of the picture, is the Mauritshuis. 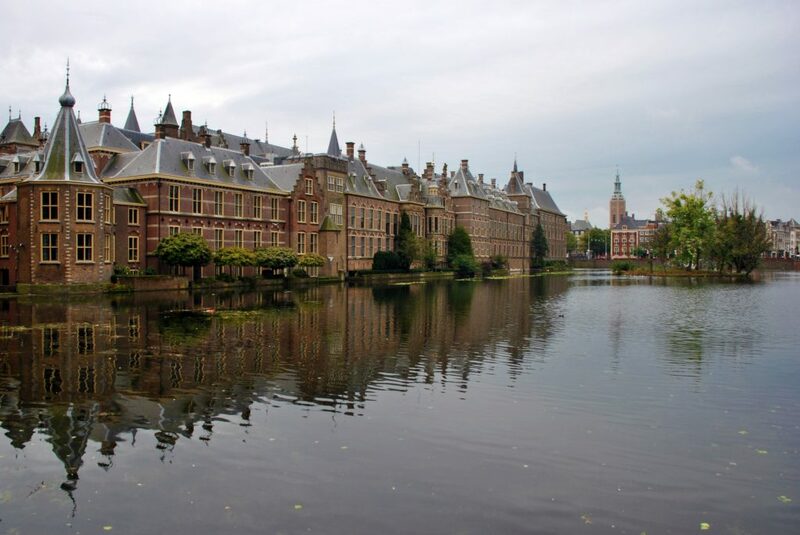 Along the water are buildings of the Dutch government, in the Binnenhof, the Inner Court, a space from which the Netherlands has been ruled since the counts of Holland took it over in the thirteenth century. Next year the government has to vacate the place for five and a half years (that’s the planning) for renovation. The migration of the libraries hasn’t stopped. To my sorrow, the KB building, taking the RKD with it, is going to be demolished in a few years. It seems to suffer from the sick building syndrome. The move will split the two institutions and take them away from the station. A lingering fear in the back of my mind is that someone in some ministry or other will remember that there was once a recommendation to merge the RKD and Rijksmuseum libraries and force them to do so. A fourth Dutch library that I love, that of the Rijksmuseum, is still – actually again – in the space for which it was built. 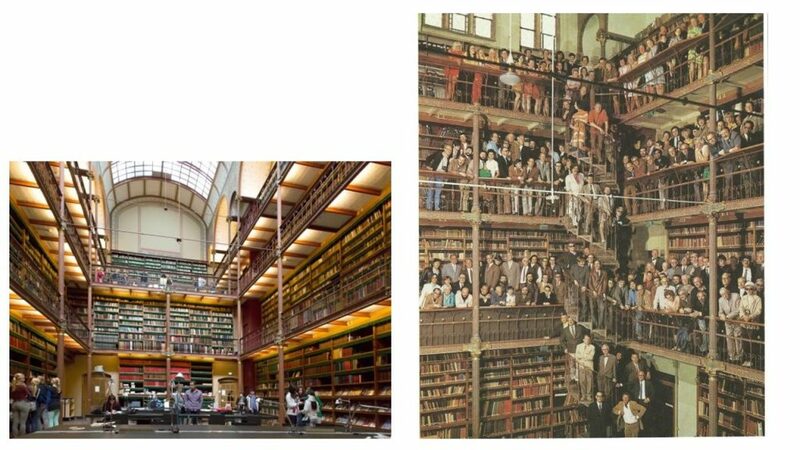 It was an integral part of Pierre Cuypers’ design in 1885, but at a given moment the reading room was rebuilt as a storage area. Not until a year after the reopening of the Rijksmuseum in 2013 following ten years of reconstruction was its original function restored. The library owes its fame in the Netherlands mainly to a photo taken in 1969 of all the authors of the Bezige Bij publishing house – writers brought to a glamorous house of the book. Of course finding a book you need and studying it gives you a charge. Love of the book compounds that effect, but also complicates it, distracting you with sensual and aesthetic pleasure. 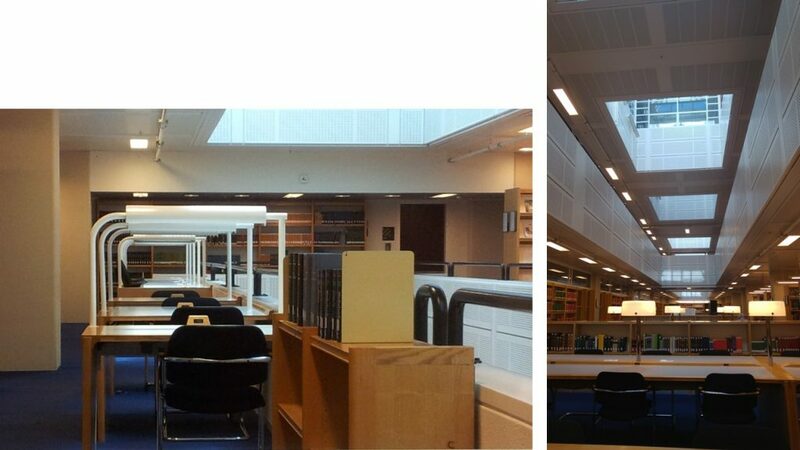 Love of the library, I’m afraid, goes further, rewarding you with a sensation of well-being just for being there. Blame it on Arlington Avenue, but it’s an affliction I am happy to suffer, and lucky to have places that bring it on. © 2019 Gary Schwartz. Published on the Schwartzlist on 31 January 2019. Yesterday evening I was in the Mauritshuis for another launching of the Rembrandt year that calls itself the first. An earlier one took place on 23 November in Leeuwarden, at the Fries Museum, where I held an opening talk at the fascinating exhibition Rembrandt and Saskia: love in the Dutch Golden Age. 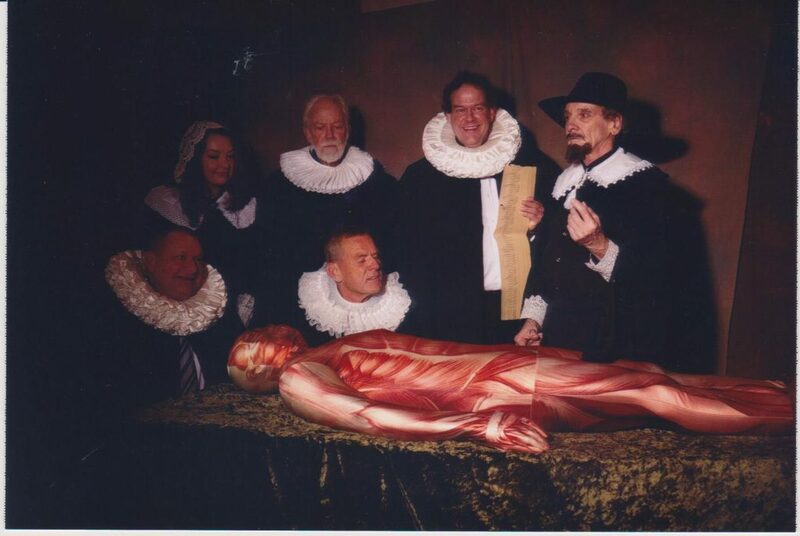 At the Mauritshuis opening I was apprehended on the way to the bar and forced into a black cloak and ruff to pose for a reënactment of Rembrandt’s Anatomy lesson of Dr. Nicolaes Tulp, hung upstairs, now as part of the exhibition Rembrandt and the Mauritshuis. Finally some good news from Washington: Elizabeth Warren’s candidacy for the Democratic nomination for the presidential elections next year. A forthright and fearless politician with her heart in the right place, Warren is also a brilliant tactician who knows how to win elections honestly and in office to get good things done. To soothe present pain, I am allowing myself the indulgence of fantasizing about a Warren presidency, in an America of my dreams. How to accommodate Trump and his MAGA base in that dream, with the Mercers and the Kochs, the Adelsons and the KKK, all I’m afraid as American as apple pie, is a problem I defer for the moment. Responses in the Reply box below (these will be viewed by all visitors to the site) – or personally to Gary.Schwartz@xs4all.nl are always appreciated and will be answered. Very nice article, thank you. Many of us will share your nostalgia. These libraries are crown jewels and should be treated accordingly (which alas they often are not). Politics and the humanities have a poor relationship these days. I had to look up the “Naches” of your title and the online definitions (congratulations/pride in one’s children’s achievements) make it seem like a jigsaw piece that doesn’t quite fit, but I must be wrong. But glad it seems to be US rather than British usage – or is my ignorance complete? Or is it meant to be ‘niches’? Thank you, Martin, also for your query about naches. Naches to me is anything that gives you an inner glow, with joy in your children as its ultimate but not exclusive form. According to that entry, naches is in the OED, which I felt relieved me of the responsibility to define it for my readers.